The West Trinity Luthern Church building was constructed in 1882. 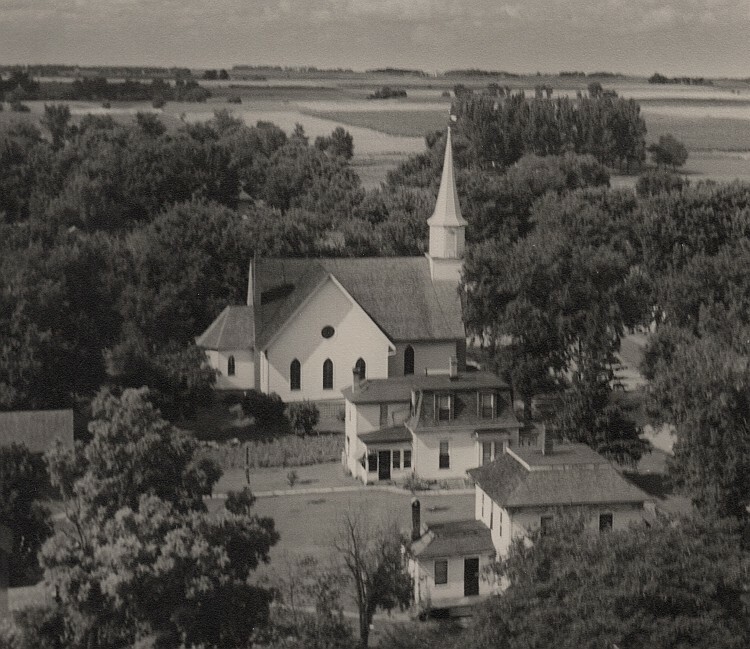 The congregation of this church joined with the Norgegian Lutheran Church of America in 1917, when this picture was taken. Lincoln Congregational Church, East Trinity Lutheran Church and West Trinity Lutheran Church are three churches with linked history. 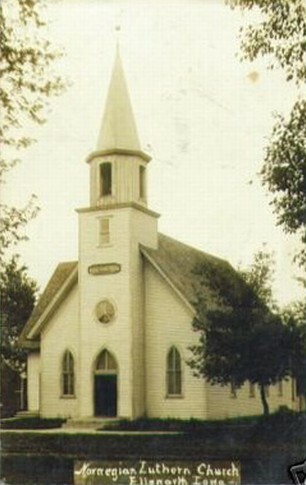 In 1890, West Trinity became a member of the United Norwegian Lutheran Church of America and located in Ellsworth, becoming Trinity Lutheran Church. Over the years the church was enlarged and redecorated, the basement being put under the building in 1920. In 1952, the cornerstone was laid for the new structure. 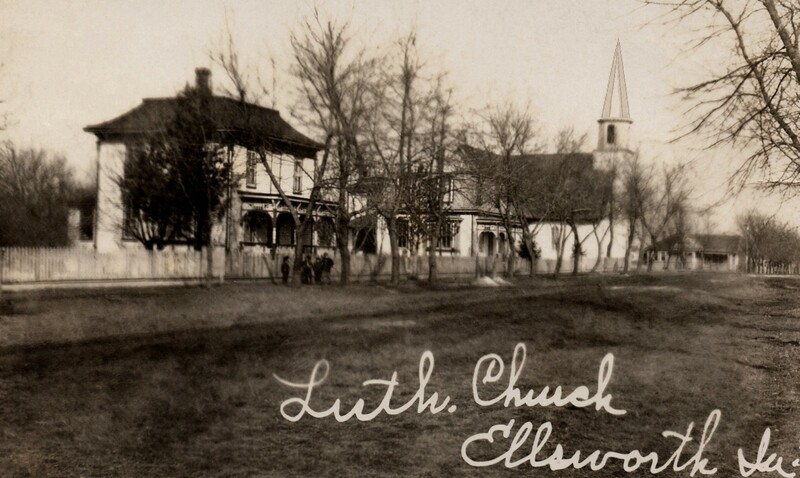 A postcard mailed in 1908 shows Ellsworth's Trinity Lutheran Church. church structure was replaced in the early 1950s with the present church building, which is seen below. Trinity Lutheran congregation of Ellsworth is to have a new church building after the war. Action toward this goal was taken at a meeting of the congregation Monday evening, when it was decided to raise money in the next two years for this purpose, rather tan to remodel the old church. As funds are raised they will be invested in government bonds. Details as to the type of building, and the time, will be decided later when materials will become available. The congregation voted not to repair the church at present, and if repairs are needed, the matter will be decided at the yearly meeting in Janurary. Dwayne Hill, chairman; Ralph Olsen, Elston Danielson, Lloyd Swenson, Manley Knutson, Ole Banielson, Willie Thoreson, Delmar Hill, Ray Thompson, and a member of the trustees, and a member of the deacons, to be chosen later. At the yearly meeting of the Trinity Lutheran church congregation yesterday afternoon, it was unanimously decided to raise sufficient funds for the erection of a new parsonage, with the building to be built and ready for occupancy - late this coming summer. The response to this decision was gratifying to everyone. Before the meeting adjourned, $4,700.00 in cash had been raised among those present. More money was contributed this forenoon, and other contributions are anticipated. 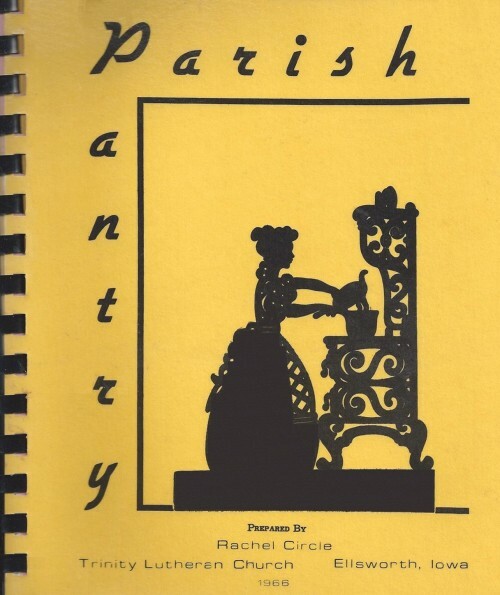 Members who were not at the meeting, and other public-spirited citizens who wish to contribute to the parsonage building fund are asked to see O. B. Iverson, who is a member of the committee. A committee was chosen to pick a suitable building spot for the parsonage, and submit its decision to the congregation. This committee was also requested to submit plans for the new house in as short a time as possible. Members of this committee consist of the church deacons, the trustees, and three members at large, as follows: R. E. Kallem, 0. J. Mansager, C. L. Peterson, Thomas Thompson, 0. B. Iverson, Jesse Hill, Dwayne Hill, Lloyd Swenson, Ralph 01sen, William Thompson and Vernon Peterson. The congregation started it two years ago to raise $50,000 to be used in building a new church when materials became available. At the meeting yesterday it was annonced that $31,392.00 had been raised in cash toward this fund, and the committee is very optimistic in its opinion that the remainder of the amount will be raised within a reasonable time. 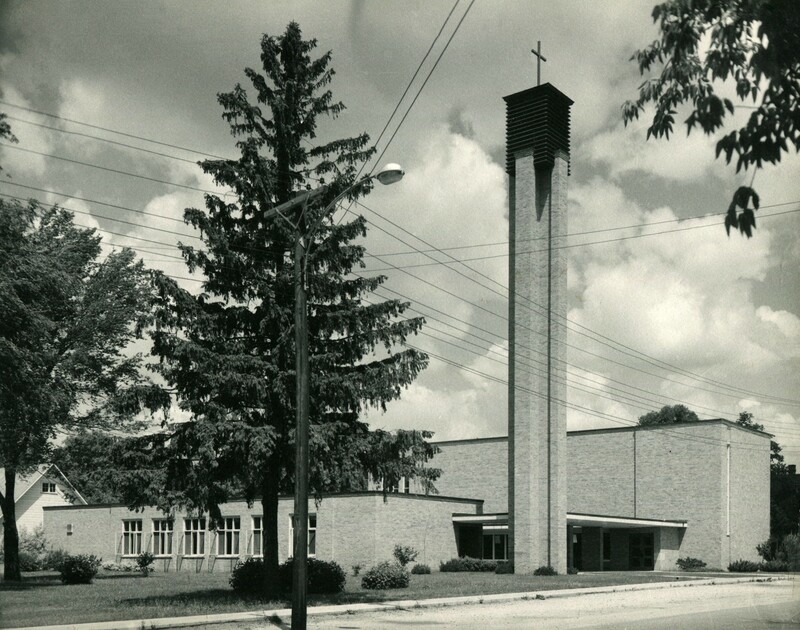 This is how the brick Trinity Lutheran Church (which replaced the old church building) looked in 1955.